This happened from time to time at work, and I've seen other people blogging about it, but none of my Ledebourias have ever bloomed, so this is exciting. Also, for some reason, Ledebouria socialis has been way more popular than I expected on the sell/trade stuff. That's not to say that a lot of people are interested (only two so far), but two is a lot more than I was expecting, and it's also half of my stock. (Agave victoriae-reginae is also 50% sold-out already, but that makes sense to me.) Maybe the profile was wrong, and they're not passed around from person to person on the sort of scale I imagined? This particular plant is one of the ones I was going to sell (it's been under lights in the basement, which is probably also why it's blooming); if it's still here when the flowers open, I'll do a follow-up post. I've never gotten a good close-up picture of the flowers yet. For what it's worth, they seem to bloom a lot more readily in the fall/winter, if they're outside for the summer. Literal 'explosions' of those tiny green flower spikes.. 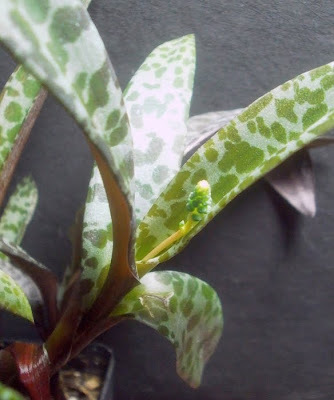 I adore my Ledebouria socialis (which is also blooming right now in my sunroom with bright overhead light all day and a bit of direct sun in the late afternoon), but I had to order it from GlassHouseWorks. I'd never seen it before in person. I think blooming must have something to do with daylight length. Mine always bloom in February or thereabouts, as the days sart getting longer--the ones in the office with the grow bulbs never bloomed, ever, because the light was on a timer. Someone on GW newly smitten by it cited your profile as igniting their enthusiasm. I believe it was the Norfolk Island Pine person. This is an intriguing plant. The leaves remind me of trout lilies (the wildflower Erythronium americanum) which are now blooming. Trout lily leaves have an oddly curious rubbery texture, and the flowers lack scent (or at least any that my nose can detect). Plants are one of those small luxuries that are pretty much recession-proof. Your business, I am sure, will flourish as your plants have. Congratulations! They are cool little flowers when they open - albeit quite tiny! Yup! Well done. I love these. When a potful of Ledebouria socialis flower all at once, it's like fireworks in Lilliput. I have one of these plants that I bought on a road trip and it made it across two states to get home. I thought it was intersting at the time but ever since I haven't had much luck with it. Can you give me any pointers on keeping this plant healthy, it hasn't done much since I got it? * regular light fertilization with NPK (nitrogen, phosphorous, potassium) and trace elements (copper, iron, manganese, etc.) included. My parent plants didn't do anything for a long time either, after we moved, but at least some of that was a fertilizer problem, because in the few months since I started using a fertilizer containing trace elements, it's started to produce much more growth, and what growth there is seems a lot sturdier than it used to be. Unfortunately, I still don't have a bright enough spot to put them in -- right now they're in a west window, but a lot of the light from the window is blocked by a tree or by the other plants on the shelves. The plant in the post that was flowering has been downstairs in the basement, where it's cooler, so it stays wet longer, the air is more humid, and it's almost touching two four-foot fluorescent shop lights so it's getting lots of light.